Yeah, don't even try to spell check that one. It won't be there. Otherwise known as a "flat" turkey this is a method that can be used on both chickens and turkeys that flattens out the bird, resulting in a more even cooking process and produces white and dark meat that are both cooked to the correct temperature without drying out either one. I have no idea how I had never even heard of this method before but it's ingenious! It makes it incredibly easy to season the entire turkey and the best part is that it significantly reduces the cooking time by up to one half! I'm going to walk you through the process step by step so that you can do this for yourself too. 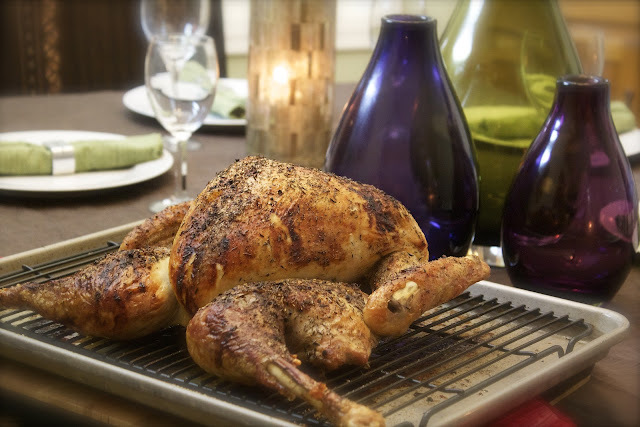 If you have time before Thanksgiving, give it a try with a chicken and then you'll be a pro for the holiday. The following process isn't pretty. There's some cutting and popping that may not be suitable for all audiences (although my kids loved watching me do it). Step 1: Our first step is to remove the backbone. This is going to allow us to open up the turkey and flatten it out. Start by flipping the bird over so that the breast side is down. Using poultry shears, starting at the tail end, carefully cut along both sides of the back bone all the way through to the other side. Remove the back bone and set it aside. Step 2: Flip the turkey over, breast side up. Pressing on the inside of the breast, push down firmly and you're going to break the breast bone. You'll feel it pop when it gives. This will allow you to flatten out the bird. 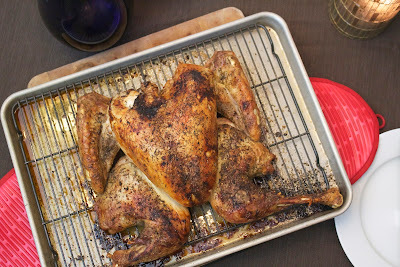 Step 3: Place the bird on a large sheet pan. Pull the thighs outward and tuck the wings under the bird. You can now season the bird however you like. Use a good olive oil and brush the skin as well as pouring some underneath the skin, along the breast meat. Season with whatever herbs or spice blend you would like. Step 4: Roast the bird at 450 degrees until the thickest part of the thigh reaches 165 degrees. If it starts to brown too quickly, you can cover it with tinfoil. Isn't it beautiful? I'm so glad that I was introduced to this new technique and I hope that you try it out on your own. One of the things that really helped pull it off was having the right tools to do the job! OXO actually sent the whole Virtual Potluck team all the tools that we would need to pull off this technique and I can honestly say that I couldn't have done it without them. Yeah, I didn't even have kitchen shears. 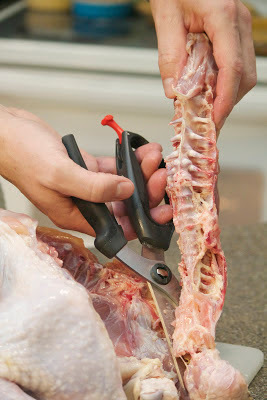 Cutting the turkey with my wife's sewing scissors probably would have gotten me in big trouble. I did have an oven thermometer but when I saw the one OXO sent me, I realized how pathetic my previous one was. 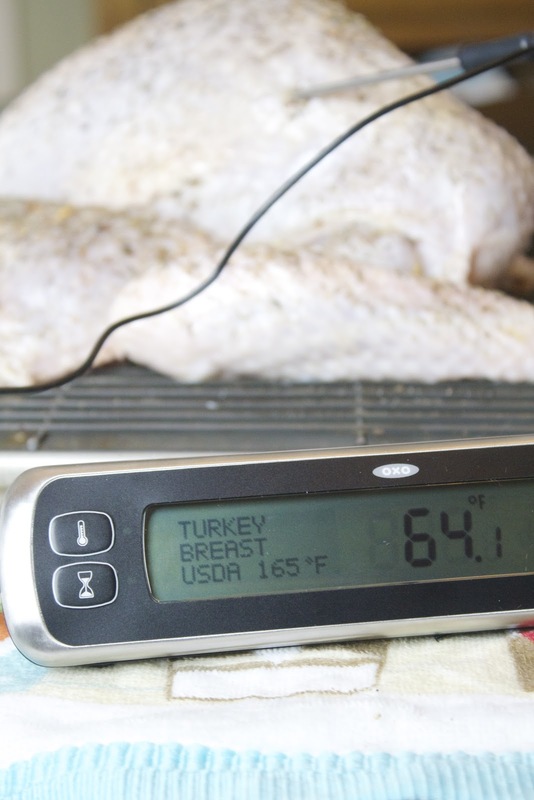 I loved being able to choose what I was cooking, where the thermometer was placed and even choose a USDA or Chef temperature. It worked like a charm, even giving me a 10 degree warning before the meat was done. Want to learn more about the tools that I received from OXO and win them ALL for yourself? Well, I've got a whole post dedicated to just that so go check it out here! When you try this method out, be sure to come back and let me know how it went or post a photo to my Facebook page! *Disclaimer: I received all the tools from OXO, however all opinions are my own. This is how I always for a 14-16 lb bird on my smoker to make sure the white and dark get done at same time. Stay away from those sewing scissors!! Thanks for the spatchcooking lesson. It is a wonderdful way to cook a bird. My Dad taught me to do this about 10 years ago. Feel like I'm on the cutting edge! Yours looks beautiful Matt, and the photos terrific as always.! Spatchcocking seems the way to go this Thanksgiving! How does the turkey turns out? I really liked how it was evenly cooked and the whole thing was really juicy! Loved it! I love this method, of course next time I will do it right! Your photos are gorgeous! 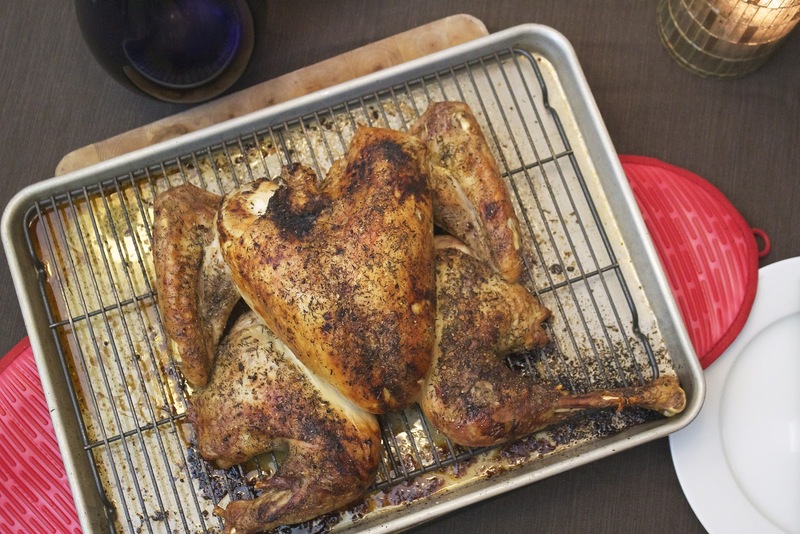 love this idea but I loved stuffing cooked inside my bird, so how can I still do this if I choose to Spatchcocking a Turkey? 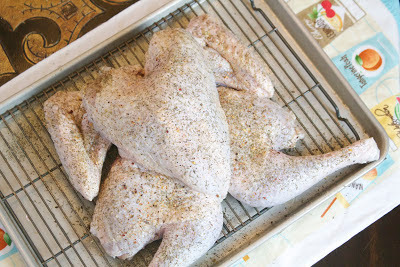 I've done this before with a chicken & put the stuffing in the roasting pan, and then placed the butterflied bird on top. It roasted beautifully & flavored the stuffing. The only down side is that you then do not have drippings for making gravy, so you need to make a stock with the neck, backbone, and giblets. That is so neat! I never knew you could make a turkey that way! Thanks for the tips and tutorial! This article on spatchcocking was really helpful, and kind of comical. I couldn't stop laughing at the second picture in step 2. It looks like you're trying to give the turkey CPR. Anyway, I think I'm going to give this a try. 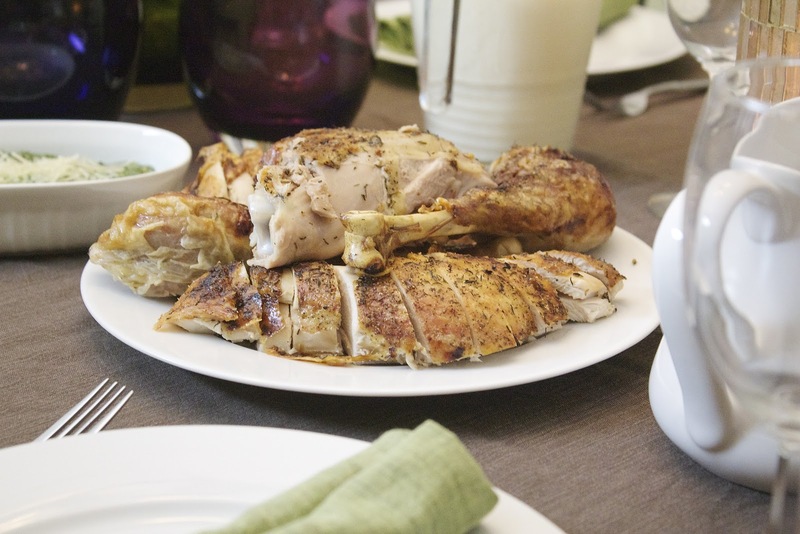 We do large 6lb chickens on the grill like this all summer - they are a huge hit!!! That bird looks amazing!!! My mouth is watering. Yum!! What kind of seasonings do you use?? Your photos are gorgeous and your instructions are perfect. I follow OXO on Pinterest! Wow! I love the technique you used. You make it easy for us.